With VitalSigns you can be aware of any problem from anywhere at any time. Mobile monitoring is the new trend. 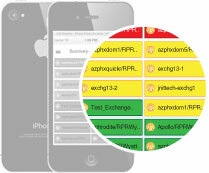 Incidents, reports and fixes can all be managed by team members from their mobile device. VitalSigns comes free with our native mobile App. No matter what you need to monitor, from on-premises infra, switches & devices all the way to Cloud End-User Experience Management. To get it, just search the Apple app store or the Google Play store for “RPR Wyatt VitalSigns”.